The Loyalty Club at Thrills Casino gives you just a little more. They want to thank their designated members who visits them and spends time with them. Their way of doing it is by giving them a VIP status. What does this VIP status offer, you may think. Well, there is quite a few things you might be interested in. One of them is the VIP events around the world, more often than not in the Mediterranean. This is a great place and chance to meet up with other players. Perhaps you will find some new friends, or maybe you’ll just go crazy on the dance floor. There is also exclusive promotions, which will be juicier than the normal promotions. Of course you will not miss out on anything, since you will get your normal promotions as well. 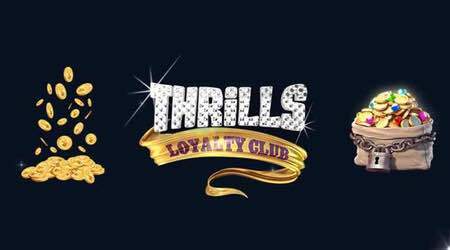 As a VIP member in Thrills Loyalty Club, you will also get prioritised withdrawals, which is exactly what is sounds like. Your withdrawals will be at the top of the list for payments and you will get your winnings faster than before. No more waiting for your new fortune, your money will get to you before you know it! And as always, you can rest assured that it’s payed out swiftly and secure. Of course this sounds great, but this is not the end yet. You also have a designated account manager, who is only there to spoil you. Well, he or she is also there for helping you in whatever way you need. It could be anything, technical questions, thoughts around bonuses and withdrawals or just if you feel like saying hi to someone. Okay, we don’t guarantee the last one, but they sure will help you with your questions. If you, like most others, think that the deposit fees can be a real buzz kill then you will be happy about this. There is now a way to get away from this fees. You probably guessed it already. As a VIP member, you no longer have to pay any fees on you future deposits at Thrills. Simply deposit the amount you want, and start thinking of where you want to play instead of the deposit. As a VIP member, you will also get bonuses with lower wagering requirement. At only 20 times it will be easier to turn your bonus money into real cash. So of course you want to be in the Thrills Loyalty Club, become a VIP member and enjoy your time there even more. But it’s not that easy to become one. However, if you already have an account and is a visiter for Thrills casino, you are already doing what you can. Thrills monitor their players activities closely and they got an eye on everyone. They will send an invitation whenever they see someone who meets up to their requirements. So make sure to play at Thrills, stay tuned and who knows, you might be one of the lucky few to get an personal VIP invite! Money Back Mondays at Vera & John!